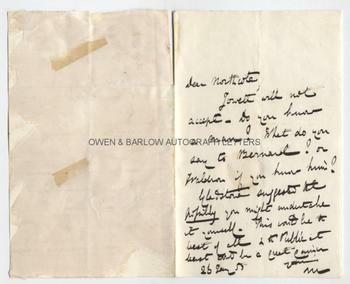 SIR CHARLES TREVELYAN Autograph Letter Signed. British (English) Civil Servant and Colonial Administrator. The reformer of the British and Indian Civil Service. ALS. 1p and integral blank leaf. No place. 26th January 1855. To [Sir Stafford] Northcote. "Jowett will not accept - Do you know a man? 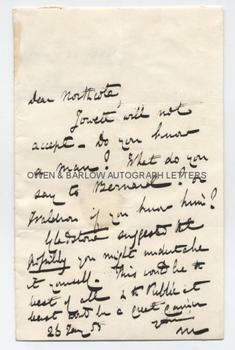 What do you say to Bernard? or Waldron if you know him? Gladstone suggested the possibility you might undertake it yourself. This would be the best of all and the public at least would be a Great Carrier." 8vo. Approx 7 x 4.5 inches. The docketing on the reverse of the integral blank has been clipped and reversed to make it visible when the letter was originally laid down in an album by the integral blank. Paper backing to verso of integral blank and with remains of old mounting hinges. The text leaf is near fine. 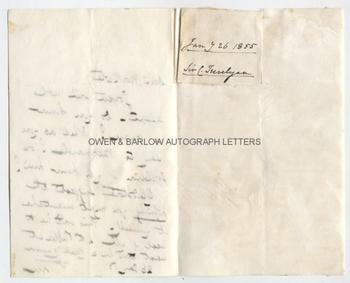 Sir Charles Trevelyan was, at the date of this letter, assistant Secretary to the Treasury. During this time he had achieved some notoriety for his role in the relief efforts in the Irish and Highland famines, which are said to have made the position worse and caused unnecessary deaths. Subsequently, Charles Trevelyan had spearheaded reforms of the Civil Service, Government Departments and the administration of other public bodies. In most of these reforms, Charles Trevelyan had worked closely with Sir Stafford Northcote. Gladstone had commissioned the Northcote - Trevelyan Inquiry into reforms of the Civil Service and a system of examinations for Civil Servants. In 1855 a Commission was set up and one of its first tasks was to appoint someone to be responsible for administering and overseeing the examination system. Benjamin Jowett (1817-1893), the Oxford academic and reformer, appeared to be the obvious choice but he declined to accept. Instead, Jowett had recommended in a letter to the inquiry two possible candidates. One of these was Theodore Walrond (who Trevelyan appears to have misnamed as "Waldron" in his letter) who was eventually persuaded to take the position. Sir Charles Trevelyan went on to be appointed as Governor of Madras and whilst there introduced a number of reforms in the Indian Civil Service, land law and other measures. However, his tendency to disregard official protocol and authority led to his recall in 1860 but he returned in 1862 as Indian Finance Minister.